Bluewater Bay Marina will hold its 2014 Christmas Boat Parade & Decorating Contest on Saturday, December 20, 2014, 5:30 p.m. This year’s event is the third annual boat parade. Head to the Bluewater docks early and see the boats as they leave for the parade. Awards and festivities will follow at LJ Schooners Dockside Restaurant and Oyster Bar. Enjoy live entertainment with Ronny Dean Garrett, Ugly Christmas Sweater Contest, a visit by Santa Claus and restaurant specials will be offered throughout the evening. 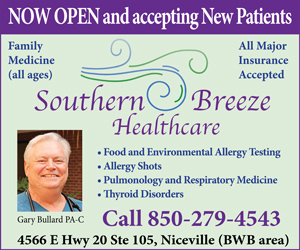 For more information call (850) 897-2821.